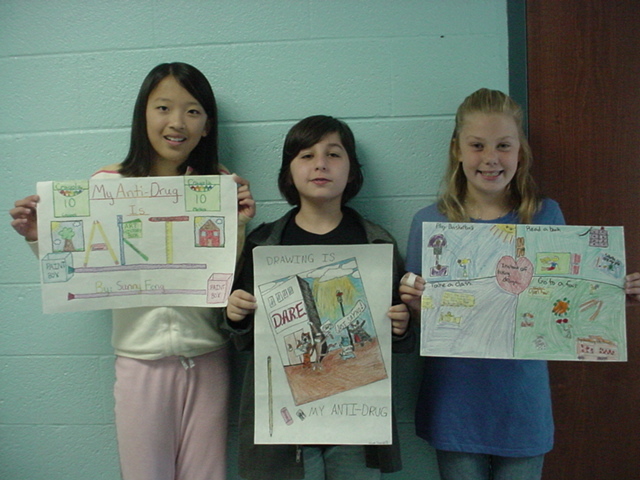 Anti-Drug Poster Contest Winners – Students in Hehnly Elementary School’s fifth grade created posters demonstrating what keeps them away from drugs in a “What’s My Anti-Drug” poster contest sponsored by the Union County D.A.R.E. Officers Association. These three winning posters were chosen by a Hehnly School Committee as the top posters at their school. Pictured (left to right) are Yuqing (Sunny) Feng, Joseph Scardilli, and Kristen Nugent.